My co-workers are in for a treat! I am on a cookie kick, and I was determined to make something cute for Halloween. I bought all these cutters... need to finally use them. I made vanilla and chocolate sugar cookies. Used a Sweet Sugarbelle triangle multi cutter I bought from Michaels. 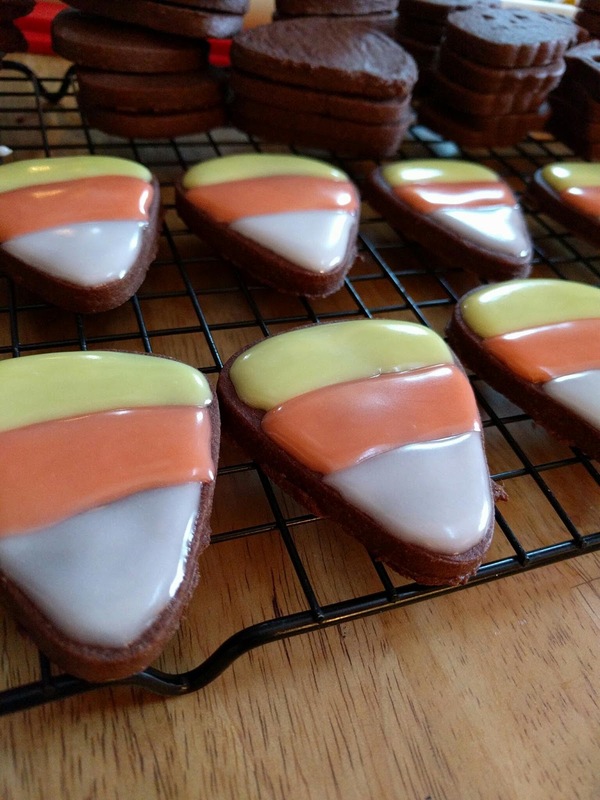 Decorated them as candy corn using a sugar glaze. I haven't made royal icing yet, but I am going to be biased and stay team glaze. I also used a couple of small Halloween themed cutters and kept those cookies plain. Because I made two batches of dough, I had enough to make for myself and for M to bring in to work. Let's see if he remembers! I fully expect these cookies to be gone by lunchtime.